I was honored to once again be invited to Vida Vegan Con, the Vegan bloggers conference held in Portland, Oregon. I was part of two presentations: Cookbook & Product Reviews workshop and Ethics Beyond the Plate panel. I'm not a very strong public speaker, but I try my best. I feel strongly about Veganism and I think my spin on it deserves a spot at the table. If I'm going to speak anywhere, it makes sense at Vida Vegan (or a Star Wars convention.) 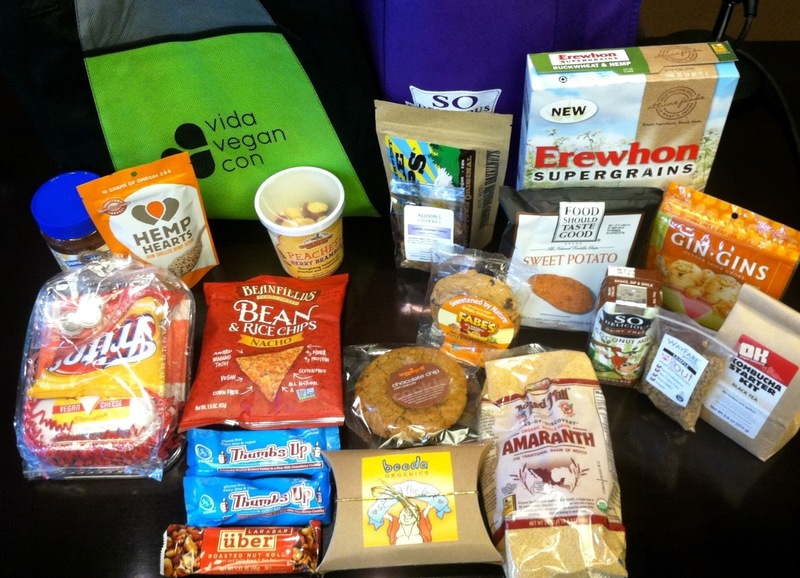 As you can see above, the 2013 Vida Vegan Swag Bag was right up my alley. So many great products! On the first day (Friday), the exhibitor hall was opened up. 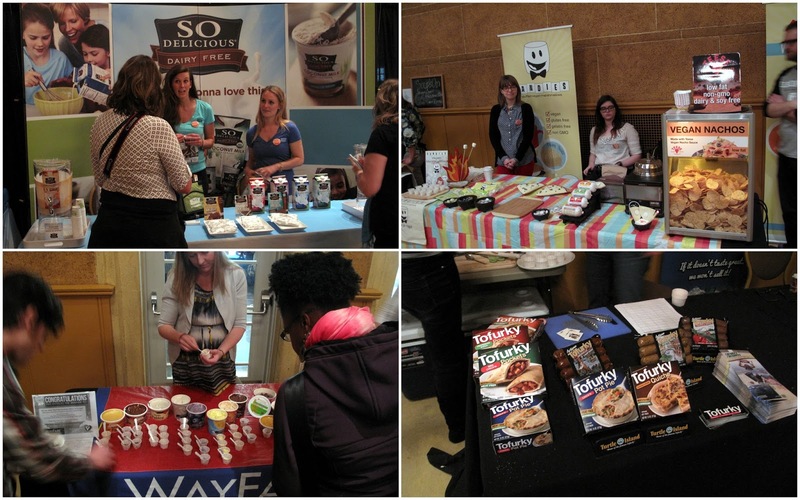 Inside, companies were ready to show off their new Vegan products. Organizers Jess, Janessa and Michele (pic, upper left) were making sure I didn't sneak in before it was time. Virtually all of the great mainstay companies were there. To be honest, I was pretty overwhelmed and didn't get half of the pics I wanted to. Also, I'm not much for crowds, but I did manage to get a couple pics off for you home viewers. All of the venders were good sports and they were more that happy to give you a sample of their amazing products. What kind of sample do you want? Ice cream? Check. Nachos? Sure. Pot Pie? No prob. I'd like to say a thank you to all of the companies that attended Vida Vegan and handed out samples. It shows that you go the extra mile for your Vegan customers, and we won't ever forget! So enough of the swag bags and samples, I'm here to do some work! The Ethics panel didn't require too much prep, only that I form my thoughts into coherent sentences (which can be difficult.) But thankfully we had some awesome panelists (Laura Beck, Jamie J. Hagen, Leigh-Chantelle and Erika Larson) who had some great ideas and opinions. Also we had an awesome moderator, Jason Das, so everything went well. Bullet dodged! But for the Cookbook/Ethics class, I made a little PowerPoint that you can see a part of above. I basically want to show that anyone can do it. I presented my steps for reviewing products and creating a blogpost (let's just say there were a few cats involved.) I had fun presenting and hopefully someone was inspired to review cookbooks or products. Thank you to Lisa Pitman and Hannah Kaminsky for rounding out such a great class. 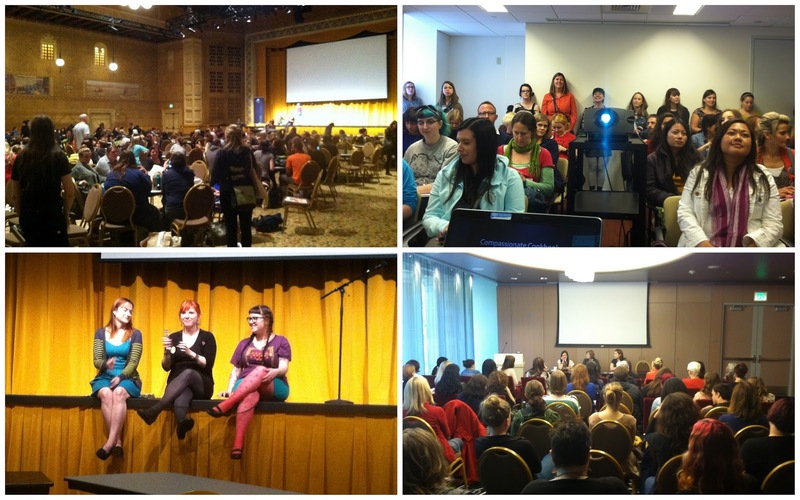 When I wasn't eating, speaking in panels or classes, I was attending other people's events! So many great things went on during the 3 days, I tried to attend everything I could. The schedule was packed and there was many good choices. A little something for everyone. And the main thing about Vida Vegan was to have fun! Yes, Veganism can be a pretty heavy topic sometimes and yes, our work is never done, BUT we have to show Veganism can be exciting and enjoyable. You have to emphasize that the choice not to eat and exploit animals is the right decision by not being a Debbie Downer all the time. One of my favorite classes of the con was the Vegan MoFo Workshop (pic, lower right-hand corner) led by Kittee Berns, Mo Martin and Amey Mathews. Veganism doesn't have to be boring and I think Vegan MoFo shows that. Being friends with Panda With Cookie (pic, lower center) proves valuable. Setting Portland on fire and eating all their pizza with Kelly and Louzilla (pic, upper right) is always a riot. Watching the Austin peeps turn a bar in PDX inside out (pic, upper center) was amazing. I could swear I was in Texas!!! And obviously, hanging out with Isa (pic, upper left) a majority of the time is a joy, xoxo. Ooh, I even won some prizes at Vegan Battle Royal! 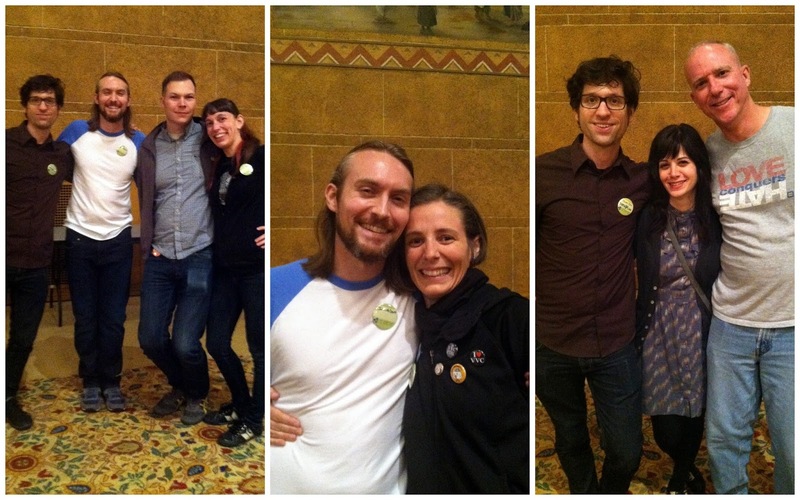 All of these Vegans in one place makes for happy times! It gives you a chance to meet new friends and get reacquainted with old friends. Whether it was my friend Dan (pic, far right) from The Gay Vegans. Jason and Jesse (pic, far right) from SuperVegan and NY Feral Cat Initiative. Dan and Nicole (pic, far left) from Upton's Naturals and Vegan Things I Like. Or my twin sister Amey from Vegan Eats & Treats (she's not really, but it sounds plausible.) Great to see everyone, I wish I had more pics! 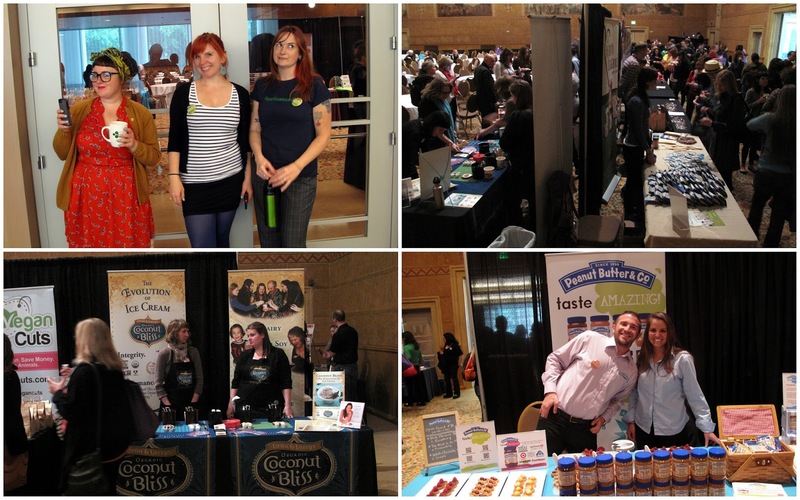 So you have Vida Vegan Con going on and all of the fun outside events happening, but there's even more! Vegan donuts, more specifically, GRAPE VEGAN DONUTS. They were my calling card for Vida Vegan 2011 and this Vida Vegan was no exception. 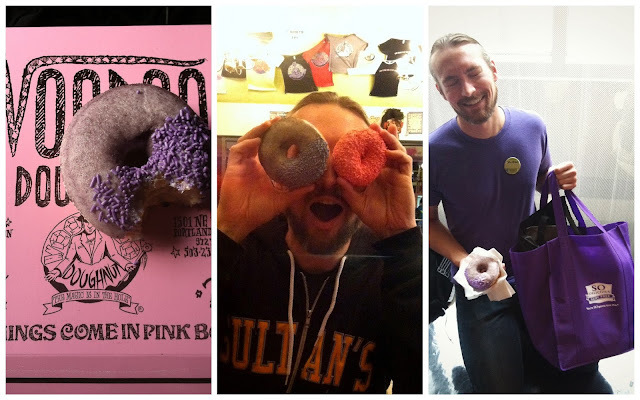 I ate at least one grape Voodoo Doughnut everyday I was in Portland. 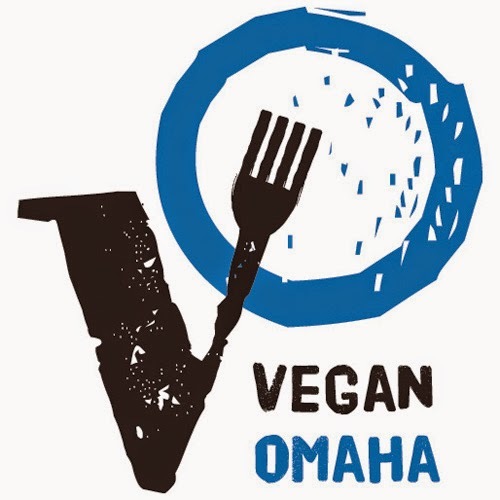 You see, I can't get Vegan donuts in Omaha, so it's kinda a big deal, you know? Peace to Voodoo Doughnuts and their Vegan Grape Ape doughnut. I'll be back soon! You can't live on donuts alone shockingly. 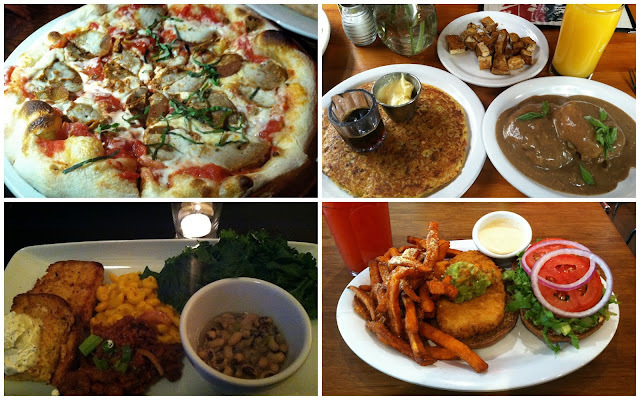 But thankfully, Portland is one of the most Vegan friendly cities in America. I ate way more than this but these are some of my favorites. Starting at the upper left hand corner and going clockwise is Portobello, Vita Cafe, Veggie Grill and Blossoming Lotus. Tons of great food, I'm so jealous of you Portland! 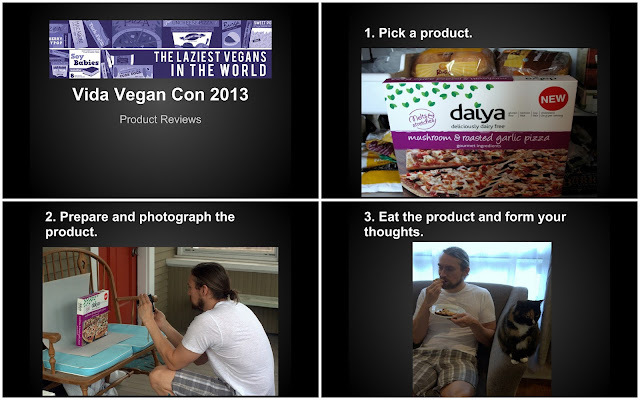 So I have no idea when or where the next Vida Vegan Con will be. My personal hopes are Chicago, Austin, Denver or even Portland again. Regardless, I'll be there, either as a speaker or an attendee. It's a life changing experience that every Vegan should get to have. Great classes, great events, great food and most importantly, great people. Thank you once again to Jess, Janessa and Michele for hitting it out of the park and making the Vegan community proud. Let's do it again! This post is an amazing advertisement for VVC! I want to go so badly next year! This is why we need to get that Kickstarter rolling, Kelly! 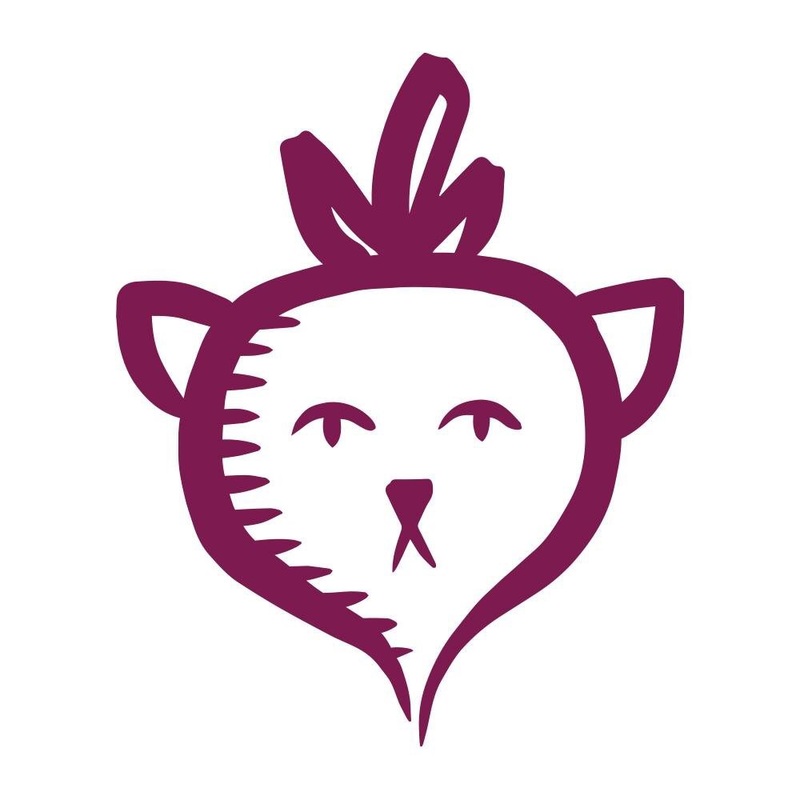 The "Send Us To Vida Vegan" Kickstarter? I really enjoyed your contributions to both talks because I was at both! I wish I had made more of an effort to socialize at VVC, but I was being too shy and introverted since it was my first time. Do you think there is a big enough market for a vegan Star Wars convention? I'd be down for that. John, you rule the school. Thanks Jess, can't wait for the next one! I so wish I could support your love of grape doughnuts. But they're kind of the worst and I have to think less of you for loving them. Other than that, though, I concur with Jess that the school is ruled by you. WHAT!?! Does not compute. Thank you Michele and let's have the next one in Chi-city. 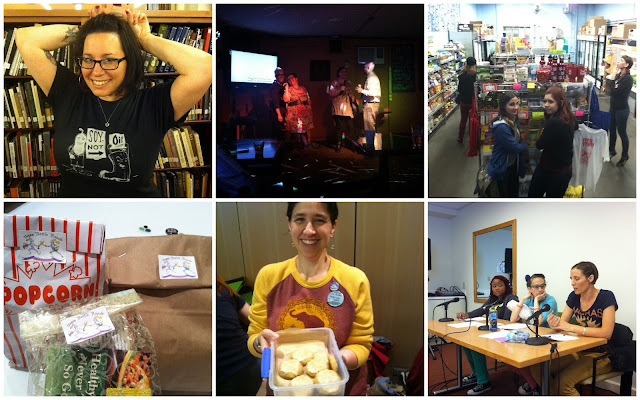 Aw, now I miss VVC, and PDX, and all the awesome vegans that were there! Great recap post!! That sounds like a really cool event and if Portland was not that far away, I'd go there soon on a food tasting trip. That swag bag is awesome too. What did you do with the amaranth? I gave most of my swag bag to Katie from Don't Eat Off The Sidewalk! since she didn't get to come. Oh hell yeah! I still have a few remaining swag bag items. I could go for a grape donut right about now. It's grape donut o' clock! Yay! Such happy memories! This is a great Round-Up post, John! I wish I had more time to peruse the vendors and all their goodies, and to chat with them. I did a little bit here and there, but the sponsors were SO great. By the way, have you tried the attune foods Strawberry Crisp cereal? It is crazy good! VVC really is such a totally great experience. I will pretty much go to every future VVC whether or not I am a presenter! That Strawberry Crisp cereal sounds good, I'll be on the lookout. I forgot you recipe book!! :( that was the cutest thing ever!!! You didn't photograph the condom party bag? Haha, forgot all about that. Hopefully someone had a good time with it! i just have to say i LOVE that your kitty joins you while you taste test foods.